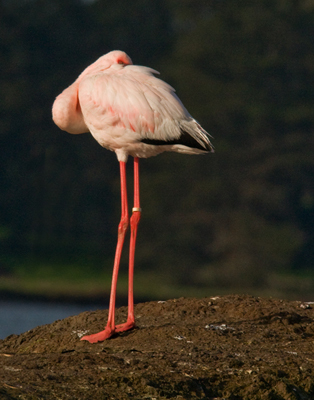 flamingo | Elkhorn Slough Sightings has moved! 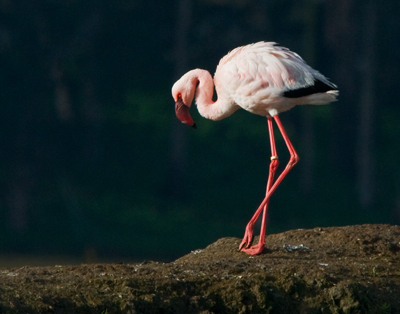 Looks like our friend the flamingo has decided to stay for a while. This was sent in by Jim Duckworth, a frequent photo contributor to elkhornslough.org’s Best Shot photo contest. The flamingo was photographed early Sunday morning on February 28 standing quietly with a group of friends, including gulls and cormorants. I had not heard about the flamingo being at the slough and as I was kayaking into the slough along the north shoreline approaching “Seal Bend” and looking for interesting bird photographs, I did a “double take” when I saw this beautiful bird standing well above all the other birds that were gathered for their early morning discussions. It stood there quietly and let me take a couple dozen photos. This was sent in from a slough visitor… Feel free to leave comments on bird ID. 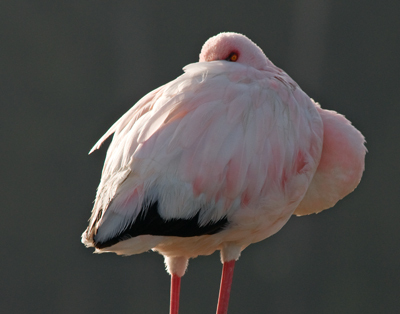 We saw the flamingo on our Elkhorn Safari tour. Also, during our hike at the Elkhorn Preserve we saw a Hummingbird and an unidentified bird (Chickadee??). Thanks to Dawn DeMarcus for letting us post it here. This blog reports recent sightings of birds, wildlife, and plants from the uplands to the waterway from the Elkhorn Slough located on the beautiful Monterey Bay in California. Help support this blog by giving to the Elkhorn Slough Foundation. Slough Sightings 2/22/13 – Sparrows!